With its squeaky cheese curds and crispy golden french fries doused in hot gravy, poutine is a deliciously Canadian mess of flavours and textures. I eat poutine more than I should; it’s a stick-to-your-ribs kind of food and the snack I crave most after a day of snowboarding. I’ve never made poutine at home, or even fried my own french fries, but in the spirit of Momofuku for 2, I decided to make a Momofuku-esque poutine: Bacon dashi gravy, double-fried Belgian fries, fresh cheese curds and bacon bits together in a lip-smacking bowl of goodness. 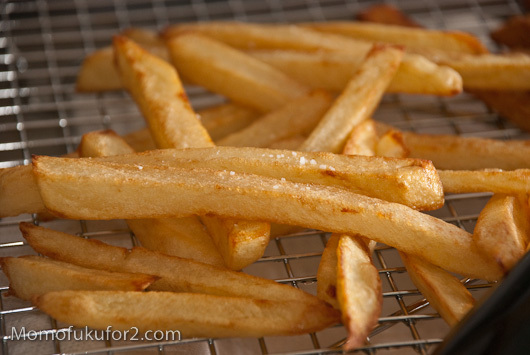 To make Belgian fries, you basically fry your potatoes twice: the first fry is to cook your potatoes, the second fry is to make them insanely crispy. I made the mistake of browning my fries too much on the first fry. You want the fries to be cooked, but pale after the first time they go in the oil, otherwise they’ll get too brown in the second fry. For a first time attempt, the fries were super addictive: crispy outsides and fluffy, soft insides. They were the perfect base for the poutine and really tasty with the bacon dashi gravy, which had the sea-saltiness of the konbu and deep bacon flavour. Bacon, cheese, potatoes, and gravy, how can you go wrong? 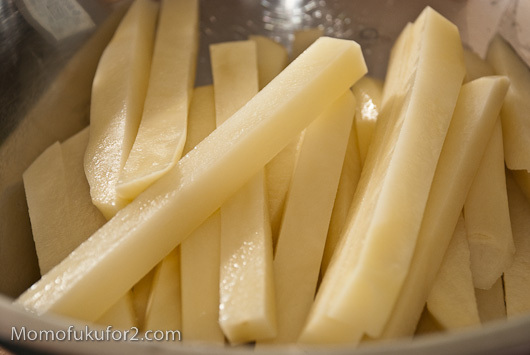 Peel the potatoes and then slice into 1 cm French fries. Soak the fries in a bowl of water to draw out some of the starch. This will make the fries extra crispy. Drain the potatoes and pat them dry. Make sure each fry is dry, otherwise the oil will splatter. 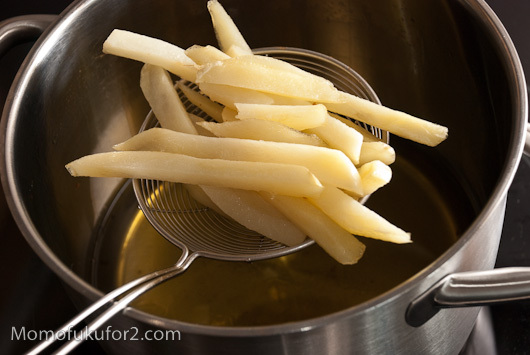 Fry the fries in batches in 320˚F oil for 5-6 minutes to cook the potatoes. 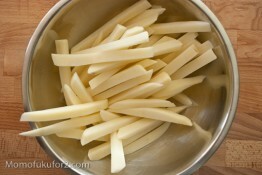 At this point the fries should be pale and cooked. 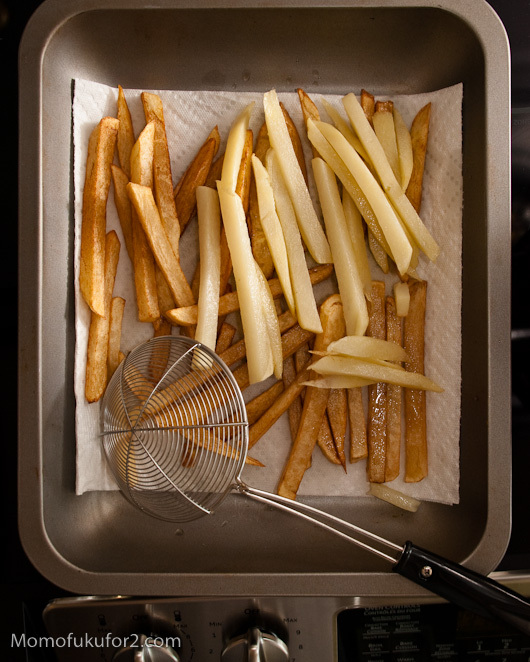 Drain the fries on paper towels and let them sweat for about 20 mintues. While you’re waiting, make the Bacon Dashi Gravy. 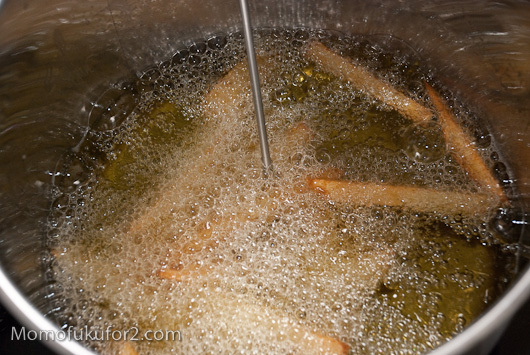 After the fries have sweat for 20 minutes, increase the temperature of the oil to 375˚F and fry for 3-4 minutes in batches. The fries are ready when they are a delicious, crispy golden brown. Crisp up the bacon over medium heat in a sauce pan. Remove the bacon from the pan and save to garnish the poutine. You should have about 1 tablespoon of bacon fat. Add the flour and whisk for about a minute to cook the flour and fat mixture. Slowly add the bacon dashi while constantly stirring. 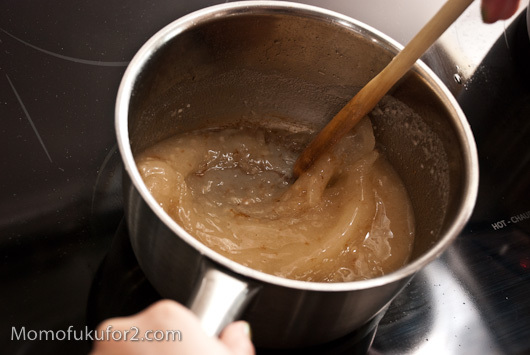 Cook and stir the gravy until thickened. Salt the gravy to taste. Keep warm until the fries are done. 1. Place hot fries in a bowl and top with cheese curds and bacon bits. 2. Pour hot gravy on top of fries, cheese curds and bacon bits. Salt to taste. Notes: If you like, you can make your poutine the “regular” way: top super-hot fries with cheese curds and chicken gravy. Can I just say, I love the way you think! And out of curiosity, is the last picture missing the gravy or is it in there somewhere…. Poutine is delicious! And the last photo is missing gravy, it was taken before the gravy pouring. Oh sweet Jesus. I wish I was Canadian right now. You don’t have to be Canadian to eat poutine! You brightened my day with this recipe! 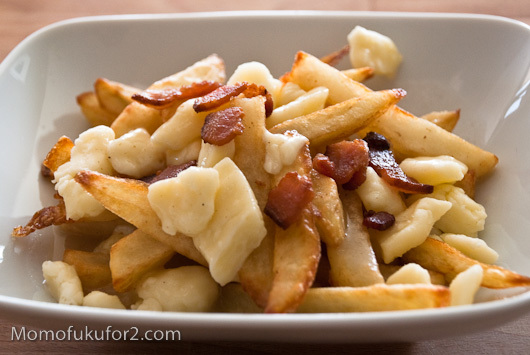 Can’t seem to find a good poutine anywhere near where I live (Poutine? isn’t he the russian president? )… Bacon Dashi gravy, yummmm. I think I would die without access to good poutine. So good. Surprisingly, this hasn’t caught on in Wisconsin – and we (well, others) eat deep fried cheese curds here! I bet the fries would be great if some bacon drippings from a really heavily smoked bacon was used. It’s a guy thing, I have to fiddle. Deep fried cheese curds sound awesome! They are. 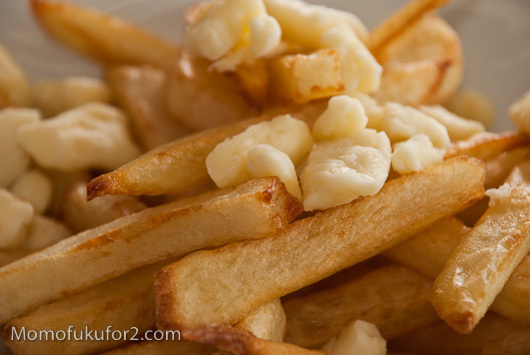 Try them with fresh cheese curds and a basic batter recipe like one for fried fish. The problem in Wisconsin is that people will eat it in the middle of summer. Between the heat and calories, they don’t want to move. Hahahaha, deep fried cheese curds definitely sounds like winter food to me. Wow bacon and dashi what an interesting mix! 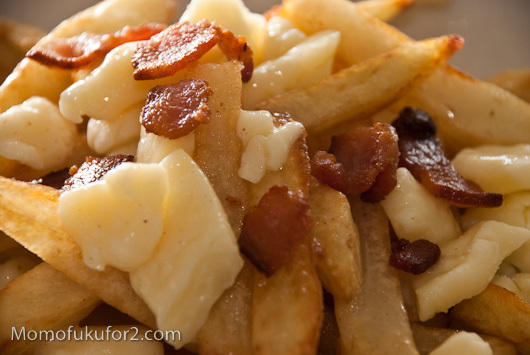 Can’t wait to try this poutine out, thanks for posting! Oh Canada! Poutine makes me proud to be Canadian! Another one of your recipes that I must make…I have a busy weekend of cooking and eating ahead! I am proud to come from the country that brought the world poutine! 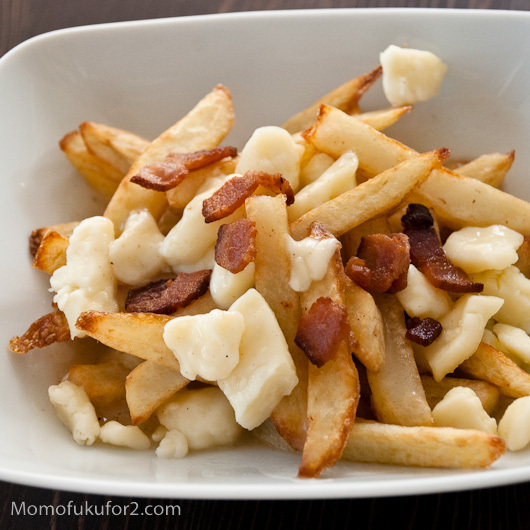 Interesting dish.I have never had Poutine but it would be something I would try. You should give poutine a try, it’s really good! 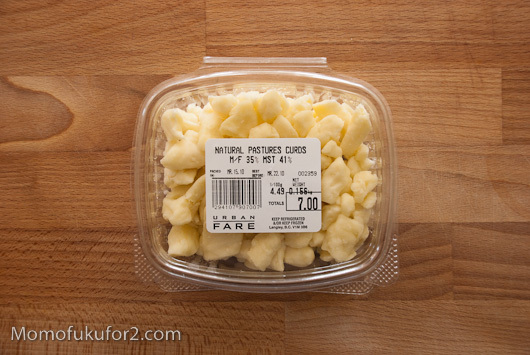 I’m engaged to a Canadian and we have tried and tried to re-create Poutine here in GA… however I have never EVER found any place that sells the cheese curds! argghh! It looks WONDERFUL! Found you via Foodgawker. I’ve never tried it, but maybe it’s worth a go? oh.my.gosh. THANKYOU!!!!!!!!!!!!!!! I will definitely give the cheese curds a try!! Thank you too, for reading! Cheese curds are seriously addictive. Especially when they’re all gooey and melty. No problem, thanks for asking! 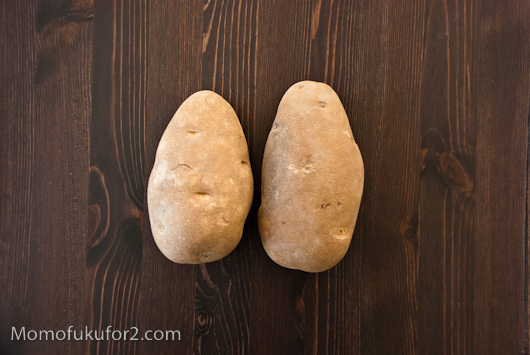 Your blog looks awesome!